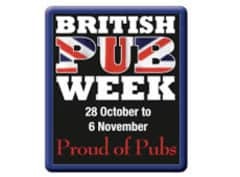 British Pub Week 2011 is almost here, from 28th October to November 6th it’s another national reason for us to get down our locals and show our support. The event, supported by many politicians, licensees, brewers and patrons, is designed to repatriate British culture with the benefits and social cohesion of Great British Pubs. Co-inciding with another Great British custom, the changing of the clocks on Sunday 30th, we all get an extra hour to play with this weekend, don’t spend it in bed, get down the pub! Our British pubs provide us with a relaxed, social, and safe environment to meet one another. Pubs have been an integral part of our society and despite much doubt regarding their future they still continue to be one of the iconic representations of how British people spend their spare time. If your local is doing anything to support British Pub Week 2011 let us know on our Facebook page, or by adding a comment to our comments section below. We’ve had a few Pubs advertise their Halloween events on our pub events list, but nobody has come forward with an exclusive British Pub Week event. Don’t forget to spread the message! Cheers!